It all begins with a Personal Property Website custom built for your home! 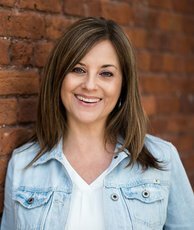 Your Home’s Personal Property Website becomes the center attraction of an all out media blitz to Websites, Other Agents, Buyers, and an array of Social Media outlets. More than just a splash page or a simple 5 page website, The Cascade Team provides a fully responsive website for your home. Your website if fully optimized and can be easily viewed and shared on laptops, smart phones, tablets and through Social Media. The Cascade Team.com is Averaging over 1,200,000 hits per month! Why? Because we provide more detailed consumer information than any other Real Estate site in the market! We provide Buyers and Sellers with what they want most…. Detailed information on the homes and communities they are interested in. This includes School Reports, City Demographics, Home Pricing Info, Market Analysis, Walking Scores that they can't get anywhere else! Proprietary. Revolving. Interactive. Marketing. Engagement. | For a 1% Listing Fee! The Cascade Team is the only brokerage to develop a proprietary system specifically designed to generate maximum exposure of your home and stimulate multiple offers often resulting in higher than asking price sales and saving you thousands! You have come to expect more and we are built to provide it. Our purpose is to bring the perfect combination of technology, local market service and marketing to position your home to sell for the most money possible. Contact one of our local real estate team members today and learn more about how The Cascade Team can assist you with your most prized asset. We strive every day to be your real estate company of choice. Interactive Smart Boards provide direct links to your home’s Personal Property website by “Text” “QR-Bar Code”, or “Website” and Provided unprecedented information about your home! Instantly connect prospects to more property information - without typing the long URL or texting. Simply snap a picture of the tag with the tag reader app on your mobile phone, and you'll be launched right to the property website! Interactive Flyer results are trackable too! See how many are viewed on-line, e-mailed, placed on Facebook and more! Instantly connect prospects to more property information - without typing the long URL or texting. Simply snap a picture of the QR code with the QR Reader app on your phone, and you'll be launched right to the property website! These QR Codes are located on all of our marketing materials. Keeps your home in front of buyers. 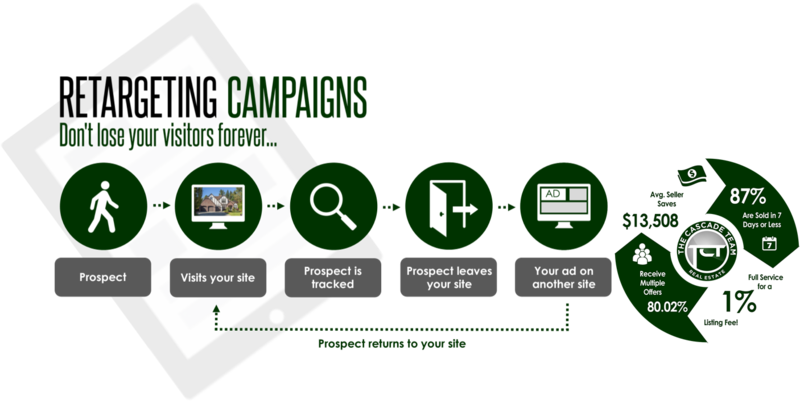 Our Retargeting Exposure is great for keeping your home in front of buyers. It starts when a prospective buyer visits your home online. After visiting, they see your home advertised on popular websites they go to. There are hundreds of websites in the network including ESPN, ABC News, Facebook, Yahoo, YouTube and more! It's great reminder to the prospective buyer to come back and take another look. Leveraging Real Estate Technology In Today's Changing Real Estate Market! View the feedback we get from other agents on your home. Find out what they liked, disliked, and the interest level of their clients from your home or office computer. 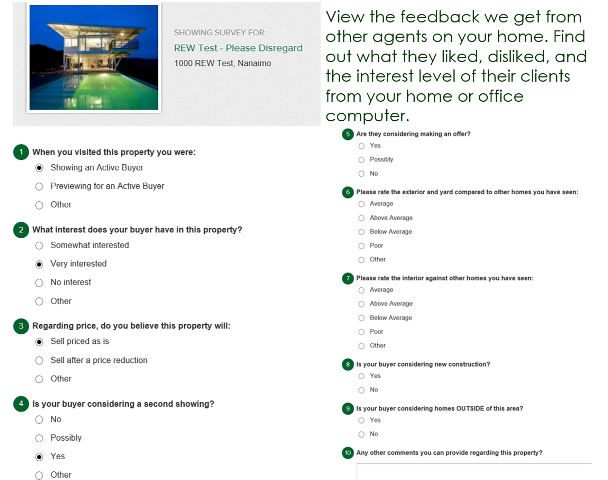 Our Home-Feedback system also stores all agent information once a showing of your property takes place. Then, once an offer comes in, we can instantly connect with all Agents /Brokers who have shown your homes and let them know an offer is in. This helps us stimulate multiple offers and ensure that you receive the highest possible selling price! The Cascade Team puts your Home in The Spotlight! The National Association of Realtors reports that 90% of all home buyers first view the home they purchase on-line. 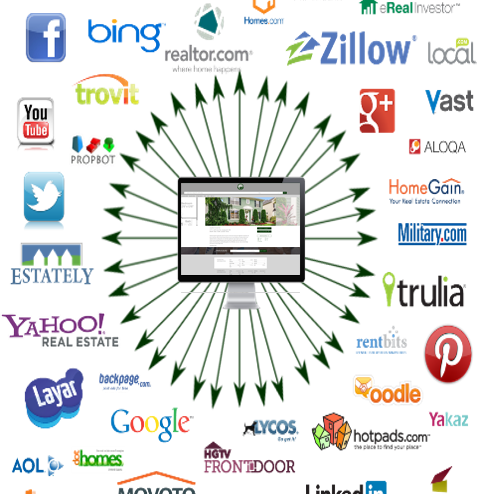 The Cascade Team represents the most comprehensive on-line presence in the Real Estate industry! We don't just promise to promote your home, we PROVE it! Our listings are syndicated to over 300 of the top Real Estate websites, and include premium placement on Zillow, Trulia, Yahoo Real Estate, and Realtor.com. Not only, do we promote your listing in the US, but we have also covered the key international sites as well. Our marketing efforts reach 16 points of contact for home buyers in China and Asia and an additional 27 in Europe and more. 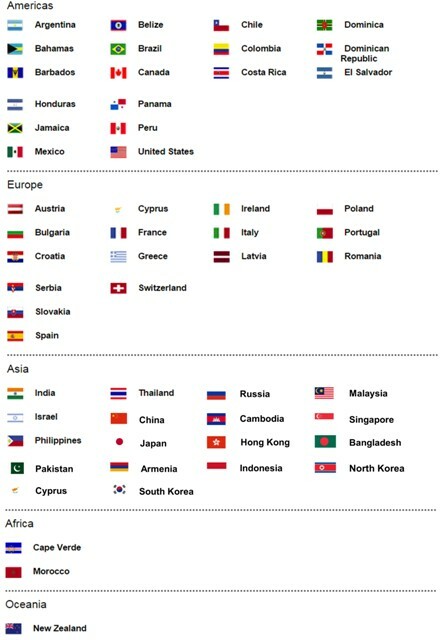 The Cascade Team will place your property in front of more buyers than any other brokerage out there, including Realtor.com International where you can search for properties in over 36 countries in 11 languages. In addition, syndication feeds are reported to you on a weekly basis. Every week you will receive an email report specifying where your website traffic is coming from. No other real estate company provides it's sellers with this real-time tracking. The Cascade Team is happy to announce its NEW 3D Walkthrough Showcase. Its available for every Cascade Team listed property. We use Matterport’s 3D technology and cloud service to create a one-of-a-kind 3D Virtual Tour Showcase. Just imagine being able to immerse yourself in a home, without actually being there. This is the 3D experience. In real estate, home images are a crucial selling point. 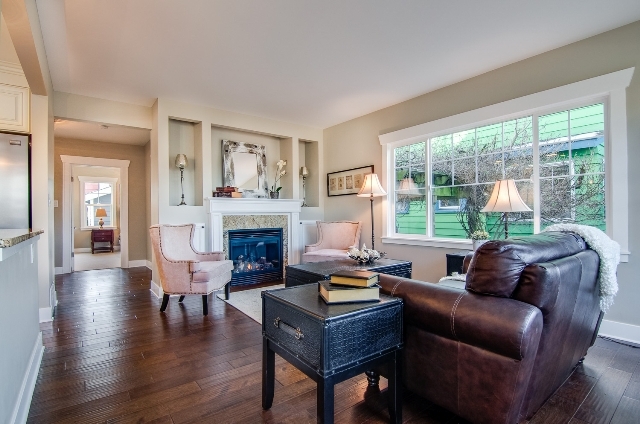 Images can either make or break a home’s perception to a potential buyer. This new 3D innovation enhances the marketability of each listing by providing an experience rather than only static photography. The 3D experience provides an engaging way of showing every room from multiple perspectives in a crisp, detailed, realistic manner. It also gives precise dimensions of features in each room. Buyers engage with the space around them as they virtually walk through the home. 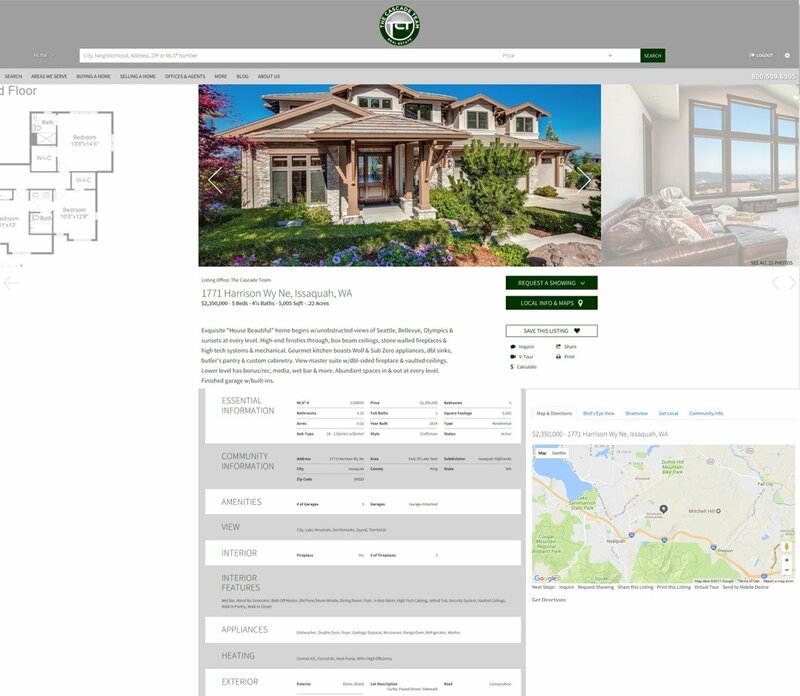 The Cascade Team.com is the first “Responsive” real estate website in the market! Responsive websites “Respond” to their environments. Day by day, the number of devices, platforms, and browsers that need to work with our site grows. Responsive web design represents a fundamental shift in how websites will operate for decades to come. www.TheCascadeTeam.com’s Responsive Web design is an approach that suggests that design and development should respond to the user’s behavior and environment based on screen size, platform and orientation. As the user switches from their laptop to iPad to smart-phone, the website automatically switches to accommodate for resolution, image size and scripting abilities. In other words, the website has the technology to automatically respond to the user’s preferences. Keeping Buyers Updated on All of our Listings, ALL the Time! Buyers can use our text codes, located on all of our marketing material, to text for more information on a property. They can text this code from anywhere, and all of the data, including the mobile website, is texted right back to them in an instant! From this texting method, we are also able to capture the buyer's contact information so we can reach out to them later with price reductions, open houses, or incoming offers on the home. This is all part of our follow through plan to keep buyers in the loop on your property. 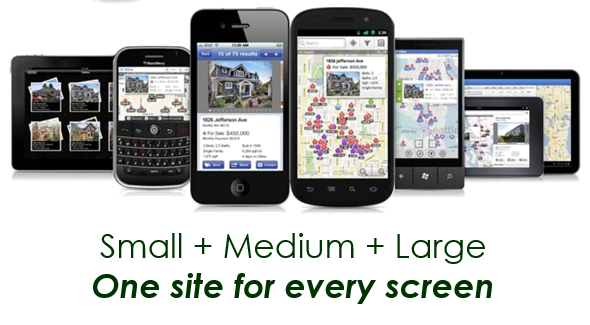 The Cascade Team Mobile MLS phone application allows consumers to view all available MLS listing information on homes for sale around them anytime, anywhere, from the convenience of their Smart Phone, iPhone or Blackberry. They can search for properties based on their GPS location, address, city or zip code. The application shows them detailed MLS information, including price, beds/baths, taxes, estimated mortgage, maps and even photos! When a consumer is ready to see a property, they simply hit the "Call To See” button and they are routed directly to an agent. Understanding why people engage in Real Estate through Social Media is what we do best. Social Networking is the fastest growing form of media in the world today. It has quickly become THE way people find out about New Products, News, Sports, Events, and how we stay connected to friends and family in this fast paced world. We truly maximize Social Media sites for your property by engaging with buyers. This doesn't just mean posting your home on Facebook! We do a fully interactive syndication on ALL social media sites. We don't just like your home. Your personal property site is fully integrated into Facebook, LinkedIn, Twitter, Pinterest, Google Plus, and YouTube. And we add enhanced search engine optimizations to help listings place higher in search results. We are the only Real Estate company in the area that is provided this service to all of our sellers. 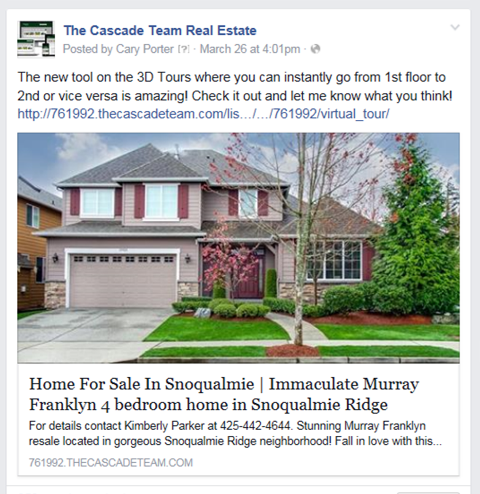 Don't forget to follow The Cascade Team on these Social Media Sites! 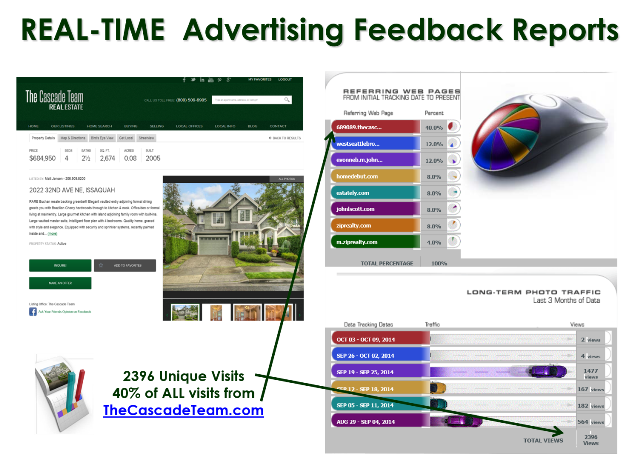 At The Cascade Team we show you, with Real-Time data, how well the advertising for your home works. We’ll show you Hits, referring sites, and even what pictures of your home people are looking at most! These syndication feeds are reported to you on a weekly basis. Every week you will receive an email report specifying where your website traffic is coming from. 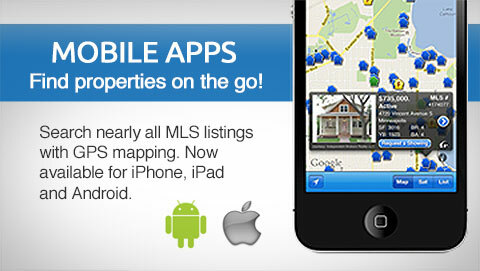 No other real estate company provides it's sellers with this real-time tracking. Keeping our sellers in the loop on this type of information is what makes us stand apart from other real estate companies. 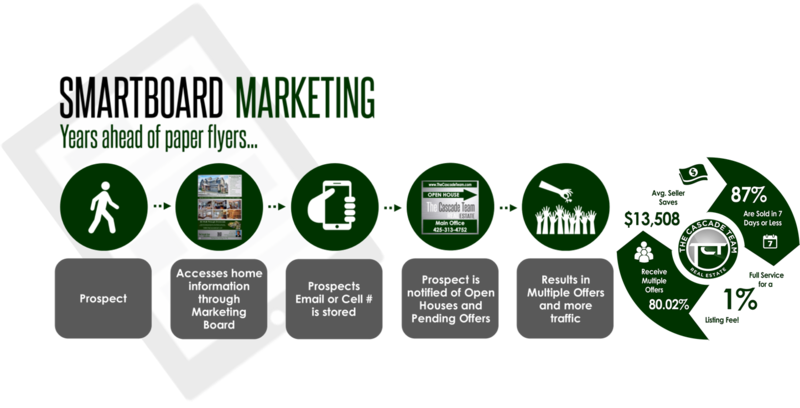 You will see first hand how our marketing program works. Our "Open House" calendar helps consumers navigate all up and coming Open House events. 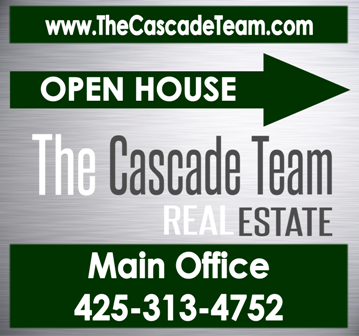 The Cascade Team Real Estate displays ALL “Open House” information for EVERY brokerage! Simply click here for: All Open House Information. 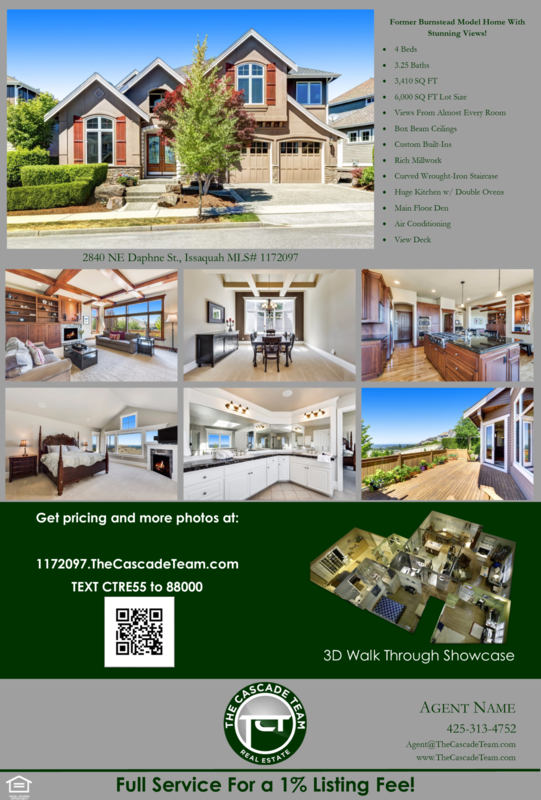 Or to see the “Open House” information for The Cascade Team Real Estate listings only click here for: The Cascade Team Open House Information. Looking for open house information. Here are all the open houses currently scheduled for Seattle and the Eastside. If you are looking for an area that is not currently displayed on this map, use our advanced home search and select open house and the city for your search criteria. All of our stagers are professionally certified and here to help! The first impression of your property is so important. Why not have a professional eye view and stage your home for maximum impact? Each of our listings receive a full staging consultation. Our stagers will walk through your home and give you pointers and tips on how to appeal to the current buyer. Once the walkthrough is over, you will receive a detailed report (with pictures) tailored specially for your home. 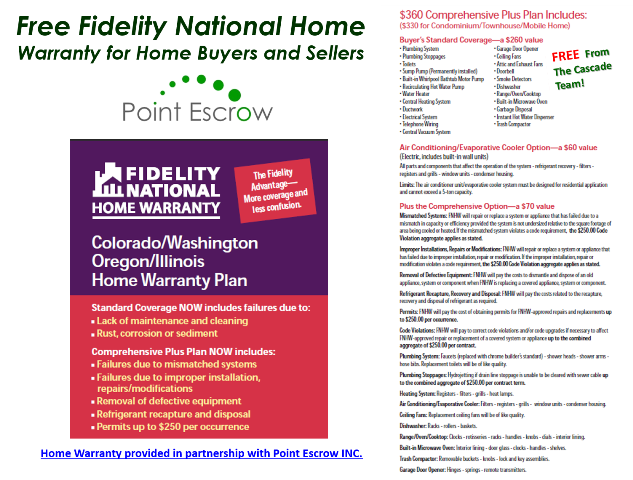 Fidelity National Home Warranty is dedicated to providing more than the customer expects! Let’s face it – all home warranty companies offer similar coverage, at a similar cost. What you won’t find everywhere is a proven commitment to personalized customer service through our automated tracking system - an innovation in the industry – in order to resolve any service issues that may arise, and an excellent service track record that speaks for itself! Market Snapshot will enable you to view all the active and recently sold listings and compare all aspects of the listings enabling you to make a more educated and informed decision. You can review these reports from anywhere and on all of your devices. View real time market statistics on the go! Get the latest trends for your neighborhood for sold homes, properties for sale, inventory counts, and even "day-on-market". You can also view information regarding schools and community. Find out what you home is worth HERE! 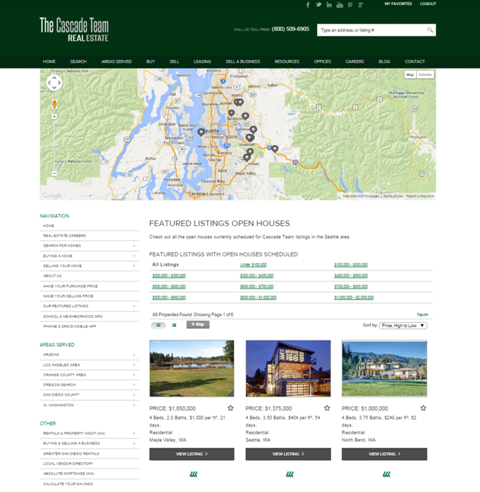 The Cascade Team provides all our MLS listed properties with open houses and broker’s opens. 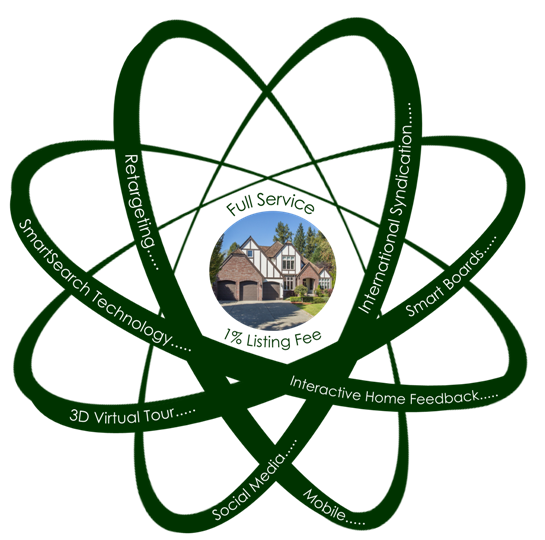 We also host Virtual Open Houses featuring website chat and virtual tours of your home. This way, if a buyer cannot make it to the Open House, they can chat with our agent while they are hosting the open house. We also promote all of our Open Houses on our Featured Open House page.